On Friday, it was off to the Palmeraie area (the palm forest of Marrakech) to tour the villas. Our first stop was Dar Iman, owned by a Moroccan, which was reflected in the exotic dŽcor. This spacious property sleeps up to 21 people. Loved the pool, the view of the Atlas Mountains, and the huge open courtyard within the villa. Naomi Campbell recently stayed here. Dar El Farth (which means "House of Happiness") followed. This 6-bedroom house is a comfortable, basic family house. Manzah el Jamile was next: this brand new, English-owned 5-bedroom villa is "over the top"-the perfect choice for upscale American clients who want their Bel Air mansion with a Moroccan flair. No children. Dar Tayda was our next stop. Extremely modern, minimalist 7-bedroom, Zen-like villa, with amazing pool. Lots of interesting art books (Andy Warhol, Dali etc.) English owners. Had a nice lunch prepared for us by the staff, and a short presentation by Youssef. The last stop on our site inspection was the most remote house of all, Villa Alexander, another English-owned property. 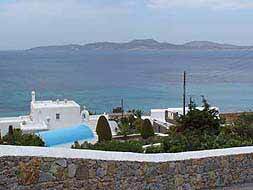 Accommodating 12, this villa is all on 1 floor, and features a beautiful garden & pool area, and is dog-friendly. Approximately 1/2 hour from town. That evening, we had dinner at the very fashionable Bo Zin restaurant in Marrakech, courtesy of the Moroccan Tourist Board of London. Eclectic ambience - artsy lighting indoors, and torches outside: South Beach meets Marrakech! Saturday had us touring several riyads, starting with VOM RIY, owned by a French artist. Very cozy, tastefully decorated, no pool, but had a Jacuzzi. No AC or TV. Riyad Lotus Ambre followed: a boutique "hotel", good for those who want to stay less than a week. Very chic. No pool, but has a Jacuzzi on a rooftop terrace (great Medina views), with pillows scattered here and there for ambience and comfort. Also has AC, satellite TV & DVD. Our next property was Riyad Meryem, an authentic 5-bedroom accommodation. Each room had bathroom with shower. Small but beautiful pool. Very comfortable, with lots of outdoor sitting areas. Riyad Shama is a 5-bedroom house (2 rooms are 2-bedroom suites) that sleeps 14. Everything about it was just beautiful - the pool, artwork, linens-you name it. Spectacular views of the mosque from the rooftop terrace. VOM CHA, where I was staying, was next on our tour route. The staff prepared a nice lunch for the entire group, almost American style - pizza, salad & grilled vegetables. Ended the day seeing a brand new property, Lotus Riyad. No one in our group seemed to like it too much (probably because it lacked warmth, and was too gaudy for our tastes). My pictures will paint a better picture of it for you. Overall, the best riyads were VOM CHA & Shama. Our last get-together as a group was that evening's "Night in White" extravaganza, held at Dar Iman. Upon arriving there with my new friend, Gloria, we saw men lining the driveway, carrying torches and wearing traditional Moroccan robes. A traditional band was playing when we arrived at the front entrance, alongside a horse with a jewel-encrusted saddle. As we walked through the front door, women starting throwing rose petals on the floor for us to walk on - felt like something out of "Coming to America"! The scene inside was no less interesting: a snake charmer, belly dancers, monkey shows, tattoo artists & everyone dressed in white. The open courtyard itself was an exotic stage, with large silk pillows scattered beneath the palms & orange trees, like a scene out of Arabian Nights-with food, cocktails, music & laughter overflowing into the wee hours. One of the best parties I've ever been to! After Sunday's breakfast, I let myself be pampered with an authentic Moroccan spa treatment in the hamman at VOM CHA, where ingredients such as olive soap, rose oil & lavender oil were used. Very spiritual. Lunch followed, topped off with a mint tea: what a wonderful experience it was at VOM CHA. Anyone would love it here! 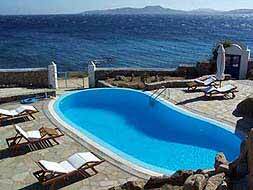 - Mykonos is a hotspot and will always draw people to its shores. The products we have to offer here are of a high standard, and I have little doubt that our clients will be quite happy. I also see the team of Federico, Barbara, Hayden, & Maria working well together: they're enthusiastic, friendly and knowledgeable. - Morocco is amazing, exotic and mysterious. This location will appeal to the adventurous Wimco client, who wants to do something out of the ordinary. Youssef has amazing energy, knowledge & confidence. He wants to utilize his creativity to focus on customer service, as well as to organize special events & activities. The standards of the villas & riyads I saw were high, and our clients will not be disappointed in all that Villas of Morocco has to offer.